Maxxor.com have been hosting our website and email for a long long time. It all started off as a year free hosting that I won in a competition and donated to FOL. maxxor kept up the free hosting and support after that but have now moved their core business away from hosting. We are now hosted on a Hetzner server and I will be approaching them to see if they will be prepared to offer us a hosting deal similar to Maxxor. The African Monarch butterfly rests on its host in a canal near Paradise Park. Thanks to the Liesbeek Maintenance Project’s work along the corridor, the canal’s are slowly transforming from sterile cement to novel habitats. On Thursday the 5th of October, FoL Chair Phil McLean, affectionately known as FynbosPhil will be leading a river walk inside Paradise Park. Paradise Park is one of the pride and joys of the Liesbeek river corridor thanks to the Friends group of residents in the surrounding community who have taken serious initiative to upgrade this public green and blue space. The Park has numerous natural play features for children to enjoy the scenic riverine environment. But the attractions of this space extend beyond classic playtime fun. With Phil’s biological insight the walk is sure to help reveal a more subtle beauty of the eco-system within the park area. The talk will be aimed at the younger generation but the more experienced are more than welcome to join in on the conversation. The walk will start from the bridge below the swings at 2pm, invite your friends and share the event on social media. This is a great opportunity to spend time learning about the Liesbeek river and how we are all reliant on the health of it’s eco-system. “In recognition of their progressive, community-managed local stream rehabilitation initiative, resulting in the conservation of the ecological-corridor of the Liesbeek river while also creating employment for the rehabilitation of the riverine eco-system. They have effectively included the river community, residents and relevant stakeholders. This innovative and unifying work is an example to be up-scaled to other parts of South Africa. Hence it would be obvious to state that we have returned to Cape Town with a renewed vigour and inspiration towards our project of rehabilitating and conserving the ecological corridor of the Liesbeek. We would like to thank all of those involved with FoL whether that be formally or informally. We are, after all, a community organisation and it would not be possible to have implemented these interventions without an active community. Phil McLean (FoL Chairman), Mncekelekeli Klaas (LMP Supervisor) and Conor Eastment (LMP Manager) receiving the National Groups award from WESSA chairman and CEO. 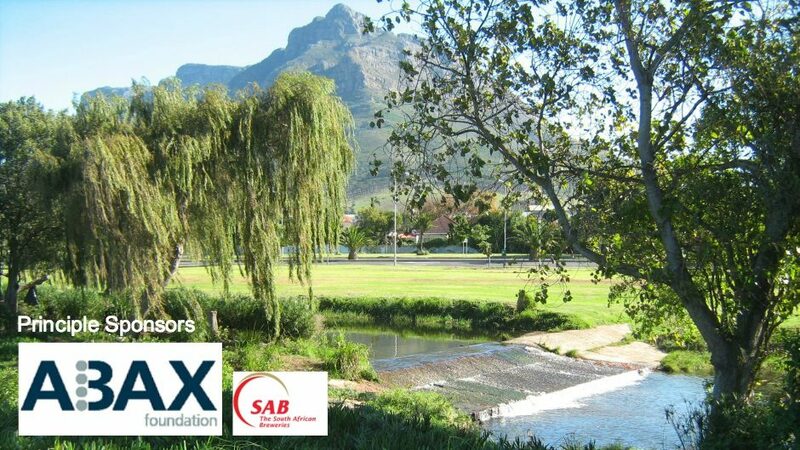 On Friday the 7th of July, Friends of the Liesbeek will be hosting a walk & talk on the Liesbeek river in Paradise Park (click on link for directions) led by Phil McLean, FoL chairperson and invasive species specialist. The event is open to any interested members of the public but is specifically aimed at children. Titled, ‘Life on the Liesbeek‘ Phil will lead participants around Paradise Park, identifying and explaining the diverse array of life which occurs on the urban river. Phil is a biological ‘guru’ and an experienced outdoor guide with quick wit, so the event is sure to have children enthralled by different forms of life found. However, this does not mean that parents and other ‘older’ people aren’t more than welcome to attend. Having recently been recognised by the City of Cape Town’s invasive species unit for his excellent contribution to the spotter network, there will be more than enough opportunity to have more, ‘boring adult’, conversations pertaining to FoL’s biodiversity rehabilitation work being done on the Liesbeek. Paradise Park is arguably one of the best spots on the Liesbeek River, with the Friends group of the park having spent plenty of time building up the park’s rest and play spots. The walk & talk will start at 3:30 and last for 30-40 minutes, but make sure to get there early or leave time to enjoy the park after. Looking forward to spending time with all of the Liesbeek folk! Phil McLean and City of Cape Town Biodiversity Manager, Julia Wood. FoL wins ‘Eco-Logic’ silver award for biodiversity and eco-community categories. Mncekelekeli Klaas (LMP supervisor) and Conor Eastment (Project Manager) representing Friends of the Liesbeek in Pretoria with the Biodiversity and Eco-Community Awards. Friends of the Liesbeek has just returned from a successful trip to Pretoria for the 2017 Eco-Logic Awards. The annual awards are hosted by Enviropaedia, a South African environmental encyclopaedia and networking platform that promotes social and environmental sustainability. The awards are held in order to recognise organisations which represent ‘eco-logic’ values. The categories which FoL were nominated for were, the Biodiversity and Eco-Community awards. Represented by project manager, Conor Eastment and Liesbeek maintenance project(LMP) team supervisor Mncekelekeli Klaas the organisation walked away with silver awards for both categories. With a judging panel including government officials from the department of environmental affairs and respected professionals in the environmental field, these awards can be considered a great privilege. A big congratulations is, therefore, required for all members of the Liesbeek community. Our organisation, founded in the early 90’s has been hard at work restoring and maintaining ecological functioning of the urban Liesbeek river, none of this would be possible without an active community. From the related friends groups of Paradise Park, Rosebank and Mowbray Greenbelt, WESSA, City of Cape Town, SANBI, the Two Rivers Urban Park Association, previous river managers, committee members and volunteers to corporate support from Omni HR consulting, Tuffy and principal funders in ABAX and SAB, our strength lies in the diversity of supporters. However, our work does not only include ecological restoration. The LMP team, supervised by Mncekelekeli Klaas, are employed on a full time basis to complete this hard work. They are currently enrolled in an environmental practices certificate at Omni HR Consulting in order to ensure that the members are empowered through employment as well as education. The team has been able to practice what they have learnt through FoL’s environmental education portfolio. They have been involved in the facilitation of school outings and corporate volunteer days. Some examples include a recent clean up and tree planting with SAB on World Environment day and hosting the Round Square schools adventure day. It is our aim to ensure that these hard working environmentalists may utilise their time in the LMP team to become catalysts of change in their respective communities. And so, it seemed fitting that the longest standing LMP team member, Klaas joined in on the trip up to Pretoria for his first flight…ever! Thanks to the financial support from ABAX and SAB, we were able to not only go to the awards, but also appreciate some of the historical sights of South Africa through a visit to the Union Buildings, a tour of Freedom Park and walking around the city centre. Moving forward, we are going to use this accolade as inspiration to strengthen the project and increase it’s positive impact. If we can be successful with 8 team members working along 9km’s of river then imagine what an expansion of the LMP team could achieve!? Thanks to all of those involved and hopefully see you out on our beautiful river soon. Mncekelekeli Klaas, our maintenance team supervisor for 8 years, embracing Madiba’s stance at the Union Buildings. We are honoured and privileged to be listed as finalists for the categories of Biodiversity and Eco-Community in the Enviropaedia Eco-Logic Awards. With a panel of reputable judges drawn from the DEA, Botanical Society of SA, Endangered Wildlife Trust and other sustainably minded corporates and organisations, the announcement is certainly something to celebrate for all of those involved with Friends of the Liesbeek. Specifically, we would like to take this moment to mention our principle funders ABAX & South African Breweries. These corporates activate our organisation by providing funding which employs 10 full time positions, pays for our maintenance team’s continuing education and ensures that maintenance costs are covered. A special mention must also be made to Friends of the Rosebank and Mowbray Greenbelt, Friends of Paradise Park, Two Rivers Urban Park and the Upper Liesbeek River Garden. These associations are crucial components to our mission of supporting the river and it’s environs. And so, it would be misguided for us to consider this as a victory for the organisation itself but rather a victory for our greater community of the Liesbeek River and all of those who make up this assemblage. Be it the homeless who pick up litter, the stalwarts who have been involved since the founding, corporates who fund our activities, residents who care so dearly for their surrounding space etc. etc. This recognition is certainly welcome, and we hope to use it to improve our impact. There is still much to do and we have big plans for the future. Moving forward, Friends of the Liesbeek will continue on its mission to open up the river space to all and to ensure that the ecological integrity of this natural corridor is protected. Obviously and quite rightly, water is the topic of our latest newsletter. You would have to be living under a rock to be unaware of the dire state of our water supply, right? We all understand the problem and see water the same way, don’t we? Well, actually, the reality would very likely surprise you quite a bit! You see, I’m on several water-related forums and involved with a few community organisations and what I hear about the public attitude to the current situation reflects a huge range of attitudes. The interesting thing is that most of these people feel like they are ‘pulling in the same direction’ as each other. We are ALL contributors to- and at the same time victims of the same crisis, so there’s a certain bonding that happens to people assailed by a common foe. But if you listen deeply to the conversations and attitudes, you will notice that ‘Common Perceptions’ (much like ‘common sense’, I fear) are not common at all! I believe that some of the strange perceptions I’ve encountered stem from our current information gathering strategies. Either because there is simply so much information about everything all the time or we’ve become lazy, but we seem to prefer to absorb flashy headlines and the first few lines of bold text, then we generally join-the-dots in our minds and complete the article in our heads. The same phenomenon supports the current fake news phenomenon, but our laziness means the news doesn’t even have to be fake for us to get the story wrong! Over the last few weeks as the crisis deepens, I see all manner of ‘solutions’ being touted or executed. People in my network are happy to extract from the river and I’ve even had it explained that this abstraction is actually an environmental service, in that this person was keeping visiting birds and insects alive (by watering their lawn with river water). This person seemed genuinely shocked that I might find that absurd and was slow to understand the abstraction implications for the variety of RIVER life that would be impacted (let alone the legal ramifications). But I guess it all finally made sense to me when I was once told that “once the water has flowed past my house, it becomes useless to me”. That is it right there! People are selfish to an epic degree and see the ‘resource’ as fully exploitable notwithstanding impacts on either the ecology or other people downstream. The fact that some people have been seemingly oblivious to their water bill escalating to over R100 000 per month while others brush their teeth using a thimble of water indicates that a great many people are living with cognitive dissonance. That’s a fancy way of saying they have inconsistencies in their thoughts versus their actions. So they claim to be supportive of the idea of water conservation, while at the same time using it with abandon. And while the knee-jerk response is to frame this as an “Us and Them” construct (or “I would never be like that”), consider the following: When YOU think about the current water scarcity and make plans to work around it, are you considering exploiting other resources (boreholes, even grey-water recycling), or are you actually trying to alter your behaviour to USE LESS water in the first place? My point it this: We are a water-stressed country and province. In 2003 we had the same problem with a few dry years in a row. Since then rainfall has remained constant (or decreased) whereas population has grown considerably. Why have we not ALL been brushing our teeth with a thimble of water for YEARS? My sincere hope is that, when the rains mercifully arrive, that you stick to a long-term behavioural change commitment to use FAR less water than you did in 2016. I hope you never see water the same way again. The beginning of 2017 in Cape Town has certainly been dominated by drought. With dam levels reaching 33% for the area as of beginning March, and a potentially dry winter forecast, the ‘doomsday preppers’ are certainly in their element. Naturally, this is an extremely testing time for the population of water users – as we so often hear, the combination of a changing climate and urban growth makes this drought a serious challenge to manage in the future. Everyone seems to be asking the same question: Where are we going to find more water? Well, while this most certainly is not a totally irrelevant question, I think that there are other questions which should be asked first. For example, why are we running out of water? How can we use the water which we do have more effectively? What is it about the current supply process that has brought us to this position? By not questioning the reasons for our current predicament, we risk jumping the gun and repeating previous mistakes. A crisis provides an opportunity to take a step back and understand how we got to where we are. This needs to be done before investing in solutions which rest on assumptions and practices that led us astray in the first place. The city’s response to the crisis has highlighted that as things stand, we do not have adequate infrastructure to continue status quo supply – something has to change. The change which has been prioritised by the authorities comes in the form of large scale, centralised infrastructure investment. The options being explored in the long run are that of desalination and aquifer tapping. These solutions apparently provide the answer to the question of “Where are we going to find more water?”. But unfortunately it is not always that simple. Desalination is known to be extremely energy intensive (anyone want more power outages?) and costs exorbitant amounts of money (current costing for the city’s plant sits at 8 billion rand). Do we need to look further than the Sedgefield desalination plant which has been sitting dormant for years? The Table Mountain Group Aquifer is a non-renewable resource, and, like all resources in this category, should certainly be approached with finely calculated caution. Any over-extraction of this groundwater would lead to the loss of discharge into wetlands, streams, springs and other natural water bodies, posing a great threat to the Cape’s biodiversity and the multitude of eco-system services this provides. Why are we running out? As a population, we simply don’t value water the way we ought. With large-scale supply schemes, consumers are so far removed from the resource and its life cycle that to them it becomes a commodified good – flowing out of the tap at a twist. There is no time and space in the current supply scheme for the water user to connect with the resource, and as a result, we only become aware of how valuable and sensitive it is when it is taken away from us. Therefore, the current drought-hype needs to be utilised as an opportunity to raise awareness of water and its plight. By bringing the consumer closer to the resource via decentralised supply schemes, water’s true value may be realised. This is not going to happen if we continue to prioritise large-scale supply schemes such as desalination and aquifer tapping as the ultimate solution. There are options for this decentralised supply scheme. Between 2 and 3 times more water falls on the City’s catchment than what is used for supply. We should be diverting the expertise and funding that is being used for the desalination and aquifer solutions and instead invest that into sustainable and decentralised options such as stormwater harvesting. I suggest all of us, need to take a moment and listen to Cinderella and their wise words of not knowing what we have until its gone. *there are even some scenes of a full dam in the music video! Before it is too late, consumers and decision-makers alike need to utilise this challenge as an opportunity to rectify our mistakes. By prioritising centralised supply schemes, we are indeed jumping the gun and trying to solve the problem with the same solutions which brought us to this point in the first place. If you’re living in the Cape you must be aware that we’re in the middle of a water crisis. It’s hard to avoid reminders of this dry reality. The province’s worst drought in over 100 years, coupled with a historically carefree attitude towards water has seen us plunge into an unparalleled crisis. In November last year Level 3 water restrictions came into effect – an all-time first for the Western Cape Province. Then, less than 3 months later, council approved an upgrade to Level 3b restrictions. Electronic billboards on major motorways now remind us on a daily basis to use water sparingly and indicate how many days of water we are left with at the current rate of consumption. This is the latest effort form the city to (almost literally!) drive home the message and inspire people to make the necessary behavioural changes. Shock tactics have also been used. Drone footage of the very empty Theewaterskloof dam has been widely doing the rounds on facebook. In print media, another strategy, one of naming and shaming the worst water offenders in the city, has also been used. This is our new reality: Climate predictions suggest droughts in the Western Cape will occur with increasing regularity. The most recent insights suggest we may be facing another El Nino period towards the end of the year, a climate scenario which will probably provide the eastern parts of the country with increased rainfall but which will mean another prolonged dry period for the Western Cape. Coupled with the growing human population in the Western Cape, full dams are something of a pipe dream. There’s been lots of talk about creating new dams, abstracting water from aquifers and turning to desalination, but the reality is, even if there weren’t the financial, legal and logistic issues to overcome, these solutions would take far too long to address our immediate problem. They’re worth considering for the future (and they are being considered!) but for now there are only two real solutions, and only one that is within our control. We do need rain, but even if more than our average annual rainfall occurred, it won’t fill our dams – and the bad news is that the predictions are that, if anything, we’re likely to get less than average rain in the months to come. So we are left with only one solution: Collectively, we need to use less water and we need to use it more efficiently. I have been interested in the approach that water and government officials used to try and get people to save water. The demand management approach to date has seen messages coming through the media which are pessimistic and most of the mechanisms being used to inspire behavioural change are entrenched with negative-reinforcement. For example, the shaming of heavy water users, and hiked water prices. It’s much harder to find good news stories and anything other than these negative reinforcements. How many messages have you seen that tell the stories of increased investment in domestic grey-water systems? What about the mad rush from businesses with water-saving, water-cleaning and smart-metering technology who have inundated provincial government with advertisements and requests to take up their technology to address the water problem? Who has heard that Capetonians have brought summer consumption down by 27%, from more than 1,1 billion litres at the same time last year, to about 800 million litres this year? Admittedly anecdotally, I’ve been amazed to see how many friends and associates have made small changes at home. It’s now common place to see buckets in people’s showers, bricks in toilet cisterns and dusty, unwashed cars. Many public bathrooms now have some sort of message pinned to the wall, “Use water sparingly”, “Save water”, “water is limited” etc. Nurseries are reporting increased sales in mulch and compost and indigenous plant species with a particular spike in drought tolerant succulent species. At least one car rental company in the CBD is offering a discount to clients willing to rent unwashed cars. Even though we’re not hitting the targeted reduction in water use set by city (now at 700 mega litres per day), people are (mostly) making changes and responding to the crisis. Zara Nicholson, spokesperson for Mayor Patricia de Lille recently said: “Although the majority of the people are adhering to the Level 3B restrictions, there are some people who are still nonchalant, and the City is tracking their water usage. They will be caught and fined.” I was surprised that the emphasis was placed on those not complying when it was worth recognising that the majority of people have made the necessary adjustments. There’s an argument to make that highlighting the good behaviour of the majority might go some way to motivating those who are lagging behind to join the cause. Research suggests that negative reinforcement tactics work to inspire initial behaviour change. However, over time they lose effect. This is where positive reinforcement needs to come to the fore. While the negative reinforcement gets change started, positive reinforcement is what keeps it going. This is known as “Push-Pull Motivation” and it’s a strategy we need to adopt if we’re going to shift the response to this crisis to a more permanent solution. The reality of our future is that the current situation will increasingly become the norm and, consequently, we need to find ways to make the changes we’re beginning to make, permanent ones. Over the longer term it would be as well for the powers-that-be to remember that people are more likely to respond to those mechanisms which recognise good behaviour to encourage people to change their ways.